Note (Speculation): I have found that there is a genetic link between our family and several families that trace their ancestors to the Isle of Wight, VA area. Records show that there was a Benjamin Newton living in this area in the later part of the 1700s, but is has not been proven that he was in our family. I believe that this Benjamin Newton may have been the father of Amos Newton and that is why he named his first born son "Benjamin." Many Virgina and North Carolina records have been lost or destroyed, so tracing Amos's path backward is difficult. Acknowledgement -- The information shown below was taken from an old Bible that belongs to Mrs. Clera Phelps. This Bible was late known to be in the possession of Ms. Deborah Cooper of Montgomery, Alabama. Benjamin Newton and Eliz Jane Davis were married 15 Nov. 1832. Malinda Melvina Newton was married 25 March 1852. Benjamin Newton, Sr. and Mary M. Elder were married 28 Jan. 1864. Malinda M. Fife was married 4 December 1853 ? Cornelius Newton was married January 1869. Rebecca Frances Newton was married November 1869. Robert M. Reeves and Amanda E. Newton were married 12 October 1884. Benjamin Newton, son of Amos Newton, was born 18 March 1808. Eliz Jane Newton, wife of Benjamin, was born 8 Jan. 1817. Martha Jane Newton,daughter of Benjamin and Eliz Jane was born 2 Jan. 1834. Malinda Melvina Newton was born 17 July 1835. Robert Ethington Newton was born 16 Dec. 1837. Mary Ann Newton was born 20 July 1840. William Benjamin Newton was born 1 Jan. 1843. James Sidney Newton was born 23 Dec. 1844. Cornelius Newton was born 30 March 1849. Rebecca Frances Newton was born 27 Dec. 1851. Amanda Emaline Newton was born 19 Dec. 1853. John Thomas Newton was born 14 Jan. 1856. Martha Jane Newton, daughter of Benjamin and Eliz Jane died 19 April 1834. Amos Newton, Sr. died 22 August 1835. Dicy Newton died 1846 ? Robert E. Newton died 3 September 1862. James Sidney Newton died 10 January 1863. Eliz Jane Newton died 19 February 1863. William B. Newton died 10 November 1863. Mary Ann Kirkland died 12 August 1864. Malinda Melvina Goodson died 25 July 1878. Benjamin Newton died 19 May 1883 (age 75). John Thomas Newton died 20 July 1916 (age 60). Cornelius Newton died 25 Aug. 1917. Benjamin Newton bought land in Robeson County, North Carolina for $264. Note: Benjamin later sold this same land to John Newton, who I believe was his first cousin. John married the daughter of Angus McQuaig and had a son name Angus Newton. Angus later married his cousin Susan Newton in Butler County, Alabama. This indenture made the 26th February in the year of our Lord one thousand eight hundred and twenty-nine between Lewis Nichols of the state Mississippi, Lumpkin County, Attorney in fact for John and Alexander Chisholm of the one part and Amos Newton of the state of North Carolina and county of Robeson of the other part. Whinesseth that the said Lewis Nichols for and in consideration of the sum of two hundred and seventeen dollars to him in hand paid the receipt of which is hereby acknowledged has bargained, sold, and confirmed unto said Amos Newton a certain quantity of land containing five hundred and sixty acres it being in the state of North Carolina, Robeson County. It containing four different tracts. One hundred acres in said state and county on both sides of Bailey's Mill Swamp including his mill beginning at a pine on the east side of the swamp running north seventeen east ninety poles to a large pine then north seventy-three west one hundred and ninety poles to a stake thence seventy-three east one hundred and eighty poles to the beginning. Two hundred acres in said state and county on the west side of Handley's (Harley's) Mill Swamp beginning at a pine near mill path and running north forty-six chains to a stake east forty-three chains and fifty links to a pine east forty-six chains to a stake west forty-three chains and fifty links to the beginning. Two hundred and twelve acres in said state and county beginning at a maple in Braswell Hunt's old line on the south east side of Handley's (Harley's) branch and runs south along that line twelve chains and fifty links to a stake and two pine in his own line then eighty-nine west along that line twelve chains fifty links to a dead pine and black jack then east along his other line forty-six chains to a dead pine then south seventy west forty chains then north twenty west twenty-nine chains then north forty east to and with the line of his new survey forty-six chains to a stake by a white oak and a pine thence the direct line to the beginning. One hundred forty-eight acres in said county on both sides of Hanley's Mill Swamp beginning at an oak on the northwest side of the swamp his ______ and runs north two degrees west along his line forty-six chains to a stake and three pines in Braswell Hunt's old line then east along that line nine chains to a stake and three pine then north twelve chains and twenty links to a black gum of Hunts comes thence south seventy-three east sixty chains eighty links to a stake by a pine and black gum thence south twenty-two chains and fifty links to a pine then east nine chains to a stake then south two chains to his line then north sixty-seven west along that line five chains to two pines then south twenty three west with and by and his other line seventy-one chains to a pine then north sixty-six west five chains to the corner of his mill survey then north sixteen east twenty two chains and fifty link then north seventy-four west thirty-eight chains then north five chains to a dead pine his corner then east forty-three chains and fifty links to the beginning. To have and to hold the aforesaid bargained land with all woods, ways, water, water courses, all houses and all other heriditaments thereunto belonging unto the said Amos Newton his heirs and assigns I bind myself my heirs and assigns and do warrant and forever defend the right of title of said land unto the said Amos Newton his heirs and assigns forever. In witness whereof I have hereunto set my hand and seal the day and year already written. State of North Carolina, Robeson County. This indenture made this 11 August 1829 between Amos Newton of said state and county of the one part and Ada Yelverton of said state and county of the other part. Witnesseth that the said Amos Newton for and in consideration of the sum of one hundred and fifty dollars to him in hand paid by the said Ada Yelverton, the receipt whereof is hereby acknowledged and have bargained, sold, and delivered and by these present doth bargain, sell, convey, and confirm unto him the said Ada Yelverton his heirs and assigns forever a certain tract or parcel of land lying and being in the aforesaid county and state on the south side of Ashpole Swamp containing three hundred and fourteen acres on both sides of Harley's Mill Swamp being part of three surveys granted to John Cade and as follows. To wit: the first survey containing one hundred acres called the small one hundred acres granted to him the said John Cade October 25, 1778 and the lesser part of three other surveys the first of which was granted to said Cade April 17, 1779 containing two hundred acres the second 148 acres granted April 18, 1790 and the third containing 212 acres was also granted to him the said Cade September 13, 1795. Beginning at a large pine by two pines on the eastern side of a brushy pond and runs south 70 west 80 chains to a stake by three pines and a black jack then south 70 east 11 chains to a pine then north 70 east 40 chains to a stake by three pines then south 17 west 27 chains to a stake then south 73 east 45 chains to a stake by three small oaks then north 73 east 71 chains to two pines then due north 2 chains to a stake by three pines and hickory then due west 23 chains to the beginning together with all woods, ways, water, water courses, mines, and minerals these _______ to the same belonging or in anywise belonging to have and to hold to him the said Ada Yelverton, his heirs and assigns forever for which the said Amos Newton for himself, his heirs and assigns doth warrant and forever defend the aforesaid tract or parcel of land with all the appurtenances thereunto belonging unto him the said Ada Yelverton his heirs and assigns forever clear from the lawful claims of any person or persons whatsoever. In witness whereof the said Amos Newton hath hereunto set his had and seal day and date as first above written. This indenture made the twenty-second day of August in the year of our Lord one thousand eight hundred and twenty-nine between Amos Newton of the county of Robeson and state of North Carolina, of the one part, and John McCormack of the said state and county, of the other part. Witnesseth that the said Amos Newton for and in consideration of the sum of eighty-three dollars to him in hand paid by the said John McCormack the receipt whereof is hereby acknowledged has bargained, sold and delivered and by these present do bargain, sell, and deliver unto the said John McCormack a certain tract or parcel of land lying and being in said county of Robeson on both sides of Harley's (Handley's) Mill Branch beginning at a large pine by two pine on the east side of a brushy pond and runs south twenty degrees west eighty chains to a stake by three pines and a black jack thence north twenty degrees west eighteen chains to a stake by two pines thence to there to run with McCormacks line north forty degrees east forty-five chains to a stake by a post oak and pine, thence north seventy-seven degrees east thirty-seven chains to a maple thence due south twelve chains and fifty links to a stake by two pines then due east forty chains to a stake by three pines then due north twelve chains and fifty links to a black gum then south seventy-three east six chains eighty links to a stake by a pine and black gum, then due south twenty-two chains fifty links to a pine then due east nine chains to a gum then due south ten chains to a stake by three small oaks then north sixty-seven west five chains to two pines then due north two chains to a stake by three pines and a hickory then due west thirty chains to the beginning. Containing two hundred and twenty acres being the same tract of land granted to John Cade in the year 1782, 1791 and 1792, twenty-six acres on a future date to him the said John McCormack to have and to hold the said bargained land with all its way (?) woods and water courses thereunto belonging. And I the said Amos Newton for myself, my heirs and assigns will warrant and forever defend the said bargained land unto the said John McCormack his heirs and assigns free and clear from all claims. In witness whereof I the said Amos Newton have hereunto set my hand and seal the day and year above written. Note: All of the land purchased by Amos Newton on 26 February, 1829 was sold through the two land purchases shown above. Also, it is interesting that Amos with held 26 acres, to be transferred at a later date. I suspect that Robeson County was never intended to be a permanent stopping point, but only a transient location. The 26 acres was most likely the land on which Amos and his family lived. Will of John McQuaig. Mary McQuaig, Administrator. Marion County, South Carolina. Citation dated 4 November, 1829. Mary McQuaig made suit for letters of Administration of her husband John McQuaig. Estate sale, 15 December, 1829: Purchasers included Benjamin Newton, Ethington Newton, and Angus McQuaig (father of the mother of Angus Newton). Note: the mother of Angus Newton was from this family and Angus was living with this family in Robeson County, NC, which is just across the state line from Marion County, SC, before coming to Alabama. It is also interesting to note that one of the buyers was Ethington Newton, since many of the children of Benjamin, Caswell, and Thomas were also given the name Ethington. Is it possible that this Ethington was Amos's brother?. 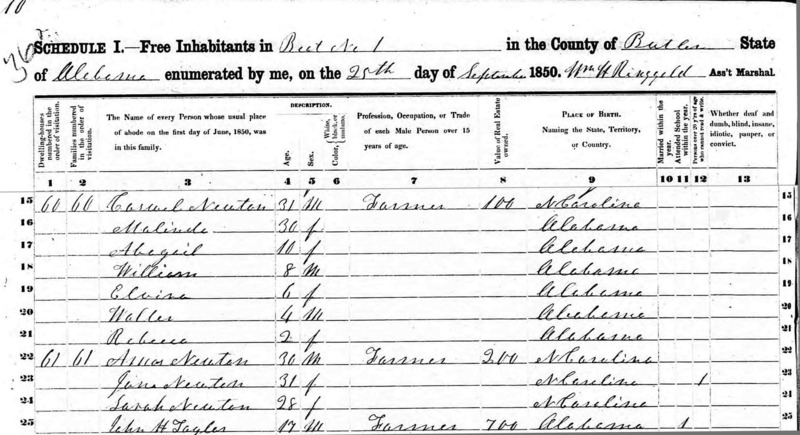 Benjamin Newton is not shown in this census record. I suspect that he was already heading south toward Alabama. However, it is possible that one of the 4 Benjamin Newton's shown in the 1830 North Carolina census records could be him. If appears to me that Benjamin sold this land to his relative, John Newton, in preparation for moving south, which is somewhat supported by Butler County, Alabama records that place Benjamin in Alabama in 1833 and all of this family was ina Alabama before the 1840 census. On 20 February, 1830, Benjamin Newton sold 3 tracts of land in Robeson County, NC to John Newton for $264. All tracts were located on the Westside of Ashpole swamp. 1st tract began at a large sweet gum and runs North 33 West 254 poles to a stake, then North 57 East 127 poles to a stake, then South 33 East 250 poles to a stake, then North 57 East 127 poles to the beginning, patented by John Willis bearing the date 17 January, 1799. 2nd tract contains53 acres and begins at a stake where Jesse Alrige's line intersects Benjamin Newton's line at the upper end of his plantation and runs with his own line South 33 east 53 chains to Edward Jenkins corner, then runs as his line North 56 East 5 chains and 50 links to a stake in the swamp at George Thompsons corner at a survey of 150 acres, then as that line up the swamp. North 19 West 39 chains to a stake in the line of his 200 acres survey, then as the line of that survey due West 9 chains, then due North until a line direct to and with Jesse Alriges line to the beginning. 3rd tract contains 11 acres situated on both sides of Jerrigan Branch beginning at a poplar in the south edge of said branch Robert Pittman's section corner of his 100 acres survey and runs No. 35 west 17 chains to a pine in Nathan Deam's line, then as his line North 30 East 15 chains to a stake in James Pittman's line, than as his line direct to the beginning. I believe her father was Joseph Kitchens (Robeson County, NC), however, this has not been conclusively shown. The state of Alabama, Butler County. Know all men by these present that we Benjamin Newton, Caswell Newton, Thomas Newton, Eli Thornton, and Sallie Thornton (wife of Eli Thornton) all of the county and state aforesaid for and in consideration of the sum of one hundred dollars to us in hand paid by Jincey Newton of the same county and state have released and quit claimed unto the said Jincey Newton all of our right, title, interest, claim and demand in and to the following described tract or parcel of land, to wit: all of that part of the southwest fourth of the southeast quarter and the west half of the east half of the northeast quarter of section four, township nine of range fifteen that lies south of the public road as it now runs containing twenty acres more or less, to have and to hold the same to the said Jincey Newton forever and we warrant and will forever defend the title to the same against ourselves and against all persons claiming through us and against none other. In witness whereof we have hereunto set our hands and seals this first day of February 1864. Filed in office for record, 1 February 1864 and was recorded 4 February 1864. The State of Alabama, Butler County. This indenture made on 28th day of November in the year of our lord 1865 between Jane Newton of the county of Butler and state of Alabama of the first part and Sarah Thornton of the same state and county of the second part. ?????? that this said Jane Newton for and in consideration of one dollar lawful money to her in hand paid and for the love and affection which I have and bear for my sister Sarah Thornton (wife of Eli Thornton) the receipt whereas I do hereby acknowledge hath granted and given to Sarah Thornton certain property. To wit: twenty acres of land on which I now reside being the same I inherited from my brother Amos Newton's estate, also all of my stock of cattle and hogs I mite own at the time of my death, one buggy and horses, all of my household and kitchen furniture that I mite have at the time of my death, I reserve to myself all the use and profits of the above property as long as I live and at my death to go into the estate of my said sister Sarah Thornton to have and to hold the same unto the said Sarah Thornton, her heirs and assigns forever. In witness whereof I have hereunto set my hand and seal this day and year above written. (Signed by Mark). The ages shown is this census are not correct. Please see the earlier 1830 census for more accurate birth dates. The State of Alabama, Butler County. Whereas at a mortgage sale made by Caswell and Amos Newton of the county and state aforesaid on the 7th day of January 1859 by Samuel J. Bolling became the purchaser of the following described lands, to wit: the west half of the north west fourth and the north west fourth of the south west fourth of section 2, and the south east fourth of the south east fourth of section 21, and the north west fourth of the north west fourth and the north east fourth of the south west fourth of section 9, and the south half of the south west fourth and the south half of the south east fourth and the north west fourth of the south west fourth and the south west fourth of the north west fourth of section 9, all in township nine, range 12 containing four hundred and eighty acres more or less lying in said county at and for the price of four hundred dollars, whereas on said day the said Caswell and Amos Newton became the purchasers jointly of said lands from the said Samuel J. Bolling and received a deed there from on the 7th day of January 1859, conveying said lands to the said Caswell and Amos Newton to each one-half interest in the same, and whereas the said Amos Newton has departed this life owning one-half interest in said lands jointly with the said Caswell Newton, and whereas the heirs and distributees of the estate of the said Amos Newton have agreed mutually to settle said estate without the appointment of an administrator, and whereas the legatees are desirous that said Caswell Newton by being one of the heirs of said Amos Newton should take the half interest of said Amos in said lands and pay the balance outstanding on said lands due from said Amos Newton at the time of his death, and whereas the said Caswell has agreed to do so in conformity to the agreement of all the parties interested. Now know all men by these present, that we Thomas Newton, Benjamin Newton, Sarah Thornton, and Jane Newton being the heirs and distributees of the said Amos Newton, deceased, have this day for and in consideration of ????? dollars to us in hand paid by Caswell Newton, the receipt whereof is hereby acknowledged have this day bargained, sold, and conveyed and by these present do bargain, sell and convey and forever quit claim unto the said Caswell Newton, his heirs and assigns all the rights, title, interest and claims which we hold in and to the above described lands by reason of said lands descending to us from said Amos Newton at the time of his death, and we do hereby agree to warrant and defend the title of half of said lands so coming to us as such heirs and distributees of said Amos Newton, deceased, against the claim or claims of ourselves, our heirs, administrators, and assigns only. In witness whereof we have hereunto set our hands and seals this the 13th day of February 1864. Sarah bought 40.06 acres of land in Butler County, Alabama - Township 59N, Range 15E, the Southwest Quarter of the Southwest Quarter. The state of Alabama, Butler County. Know all men by these present that we Benjamin Newton, Caswell Newton, Thomas Newton, and Jincy Newton all of the county and state aforesaid in consideration of the sum of two hundred dollars to us in and paid by Eli Thornton of the same county and state have remised, released and quit claimed all of our rights, title, interest, claim and demanding and to the following described tract or parcel of land, to wit: all of the south west quarter of the south east quarter and all of the west half of the east half of the north east quarter of section four, township nine of range fifteen that lies north of the public road as it now runs, to have and to hold the same to the said Eli Thornton his heirs and assigns containing sixty acres more or less and we warrant and will forever defend the title to the same against ourselves and all others claiming under us. In testimony whereof we have hereunto set our hands and seals this first day of February 1864. Filed in office for record 1st day of February 1864 and was recorded 4th day of February 1864.